According to a lawsuit filed by Hadoop startup Zettaset against Intel, the microprocessor giant didn’t just infringe on Zettaset’s Hadoop technology — it flat-out stole it. “In multiple and uncanny ways, Intel’s product is Zettaset’s product,” Zettaset claimed in a complaint filed last Thursday in Santa Clara County, California. Zettaset is suing Intel for breach of contract, misappropriation of trade secrets and intentional misrepresentation. The complaint tells the tale of a hot-and-heavy partnership agreement that lasted for the better part of 2012. 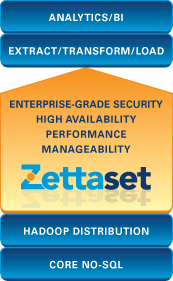 Zettaset shared its Orchestrator Hadoop-management code (and lots of other information), Intel benchmarked it and the two companies ultimately began planning a commercial collaboration. There was talk of an Intel Hadoop appliance powered by Zettaset, and Intel Capital was considering an investment in Zettaset. In early 2013, however, the talks slowed down until Intel announced its Intel Distribution and Intel Manager for Apache Hadoop products in late February. The Hadoop management software is the focal point of this lawsuit. Because they’re so similar in functionality, Zettaset claims, Intel’s distribution is the only commercial Hadoop distribution with which Orchestrator isn’t compatible. “[T]rying to run Zettaset on top of Intel is akin to trying to put a key into a lock already occupied by a key,” the complaint alleges. To make matters worse, Zettaset alleges that Intel then approached Zettaset’s partners and potential customers, positioning itself as a direct replacement for Zettaset. It’s not evidence by a long shot, but here are Zettaset’s and Intel’s Hadoop marketecture charts for the sake of comparison. 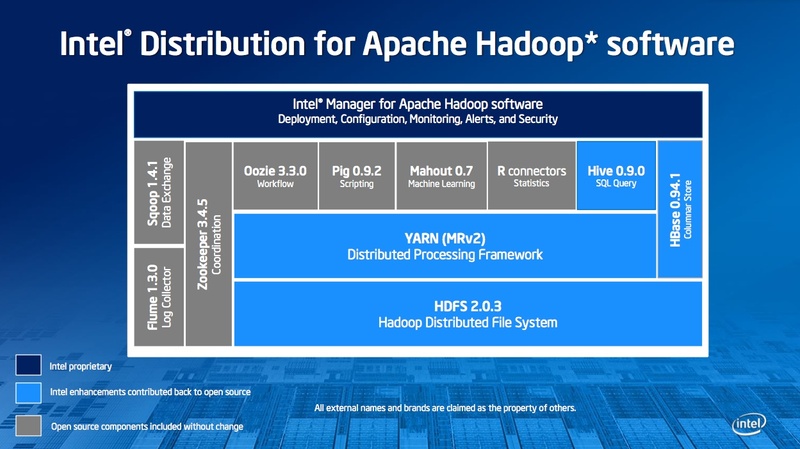 Intel Distribution for Apache Hadoop. It’s difficult to assess how, if at all, they’ll factor into the resolution of this lawsuit, but there are some additional facts worth noting. One is that Intel had been offering a version of its Hadoop distribution in China since July 2012 (a short time after Intel received Zettaset’s code, according to the dates in the complaint)but had been working on Hadoop since 2009, according to a post on ZDNet. And then there’s Intel’s own legal history. This won’t be the first time the company has had to defend itself against claims of unfair trade practices, although it might be the first time the company is accused of breaking the law in the name of entering a market rather than to abuse its near-monopoly status in the microprocessor market. It looks like the small guy has been swallowed hook line and sinker by the big-data-big-bully. Simple fact is this… when on earth does a major IT player… IBM..HP..Oracle..Intel bring out something of its own, thats fast etc into marketplace? They usually acquire… or different in this case. Look at it in terms of trying to do business with these outfits…. agile? not on your nelly. Fast? paint dry’s faster. Getting a meeting in there? impossible, pushing the procurement cycle? – quarter busting, are they rich?… absolutely…. Good luck to Zettaset… the oil tanker of Intel may run around on this one! Interesting action in light of this article. Very interesting, indeed. I hadn’t seen that. I suspect you’re onto something. Will be interesting, too, to see what Intel says it was working on prior to/separare from this and how it compares. Yeah, I think it’s going to be really difficult to prove ‘fault’ especially as commercial & open source interests have become so intertwined in the Hadoop world. Will be watching this one closely.